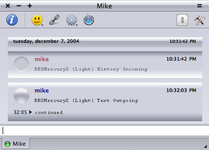 Changed the status images for the Light variant from black to match the menu bar in the osx theme instead. I must agree... maybe a dark gray/blue, like appears in the gradient for the incoming text's bubble/block/thing. Also, the gradients on the sides of the date-separator are a little weird. On a different note: The icon you gave this could make a sweet dock icon (though, being a traditionalist, I probably wouldn't use it). thanks for the feedback ^^ . i was waiting for a second comment before i went ahead and did some changes to the black. to me, it seemed like it was more bbx mercury x style, but ah well. i'll make some adjustments for the next version. most likely by next tuesday. and, that could make a neat dock icon... never thought of making a dock icon before... i may do that later on. if you look in at the readme provided w/ BBX Mercury, you'll see that the color of the menus is provided. Its much easier on the eyes than black. 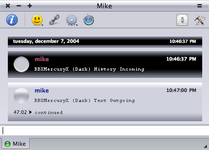 No problem, I use BBX Mercury as my main theme anyhow. I'd love to see this fit in right. As soon as I installed this Adium started crashing whenever I went to the message prefs. Does anyone know how I can unistall this add-on? I have tried digging around the package contents, but I can't find it. Nice theme. I like the dark.